Israel is one of the most disliked nations in the world among Britons, following a surge in anti-Israeli sentiment in 2014. The country is viewed so unfavorably by UK citizens that even Iran, a nation known for its brutal suppression of protests, is not disliked as much. North Korea topped the list as the most reviled nation outside Europe in the survey conducted by think tank Chatham House on British attitudes towards other countries. Within Europe, Russia took the lead as the most disliked nation with Ukraine coming second and Turkey third. 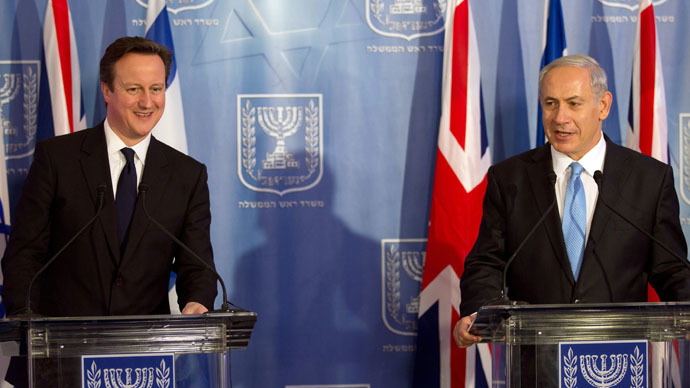 Changing views on Israel and Russia are reflected in tourist trends, with both countries seeing a drop in UK visitors. Published in a report, ‘Internationalism or Isolationism? British attitudes towards the UK’s international priorities,’ the survey probes British views of other countries, as well as the UK’s role in international affairs. Conducted in August 2014, the survey is likely to have been influenced by Israel’s Operation Protective Edge in Gaza, launched July 8. Widely reported by world media, the conflict resulted in the deaths of an estimated 2,192 Palestinians and 6 Israelis, according to UN figures. Israel’s popularity dropped significantly in the survey, with 35 percent of respondents saying they felt “especially unfavorable” towards the country, compared to 17 percent expressing the same sentiment in June 2012. Iran meanwhile fared marginally better than Israel, with 33 percent of Britons feeling “especially unfavorable” to the republic compared to 45 percent – the highest figure at the time – feeling the same way in 2012. Iran’s slight improvement in public perceptions may be a result of its new leadership, with President Rouhani generally seen as a more progressive politician than his predecessor Mahmoud Ahmadinejad. With 47 percent of Britons disliking North Korea, the reclusive state has become Britain’s public enemy #1, representing a shift from second place in 2012 when Iran held the honor. Public sentiment against North Korea is likely to have been influenced by the publication of a long-awaited UN report in February 2014 which compared the regime’s systematic crimes against humanity to those of the Nazis. Russia was most disliked within Europe, with 56 percent of the public feeling “especially unfavorable” towards the country, compared to 30 percent expressing the same opinion in 2012. This dramatic increase is likely the result of the Ukraine crisis in April 2014 and Russia’s perceived role in the ongoing conflict. Ukraine was the second most disliked country in Europe, drawing the ire of 23 percent of Britons, while Turkey came in third at 17 percent. British perceptions of other countries seem to influence tourism trends, with Israel reporting a significant drop in the number of British arrivals. In 2014, roughly 164,000 British tourists visited Israel, a fall of 9,000 on the previous year, according to Israel’s Central Bureau of Statistics. The slump has been widely covered in Israel’s media, with the Jerusalem Post reporting overall tourism dropped 7 percent in 2014, despite an 18 percent increase in the first half of the year. Just over half of all tourists to Israel are Christians, many of whom are travelling to see the Holy Land. Julain Primm, of British-based Worldwide Christian Travel, said the company saw a drop in bookings to Israel from August until the end of the year. In spite of this, “total numbers for 2014 were in fact slightly up on 2013,” he said. Russia saw its own drop in tourism last year, with Travel Weekly reporting international arrivals to St. Petersburg fell by 15 percent. Speaking to The Telegraph in September, Andrea Godfrey of Regent Holidays said inquiries for Russia were down 55 percent. She claimed the actual holiday experience had not changed, however. “Having just returned from Russia, I found that everything is business as normal,” she said. Britain’s favorite foreign land in Europe is The Netherlands, according to the Chatham House survey, with 33 percent feeling “especially favorable” towards the country. 1.1 million Brits visited Holland in 2013 according to the Netherlands Board of Tourism & Conventions (NBTC). “Plus, Holland’s positive reputation is further enhanced by the fact that many high profile and well respected Dutchmen are players or managers in England’s Premier League,” she added. Take note Israel, Iran and North Korea: when international diplomacy fails to improve your profile, join an English football club!